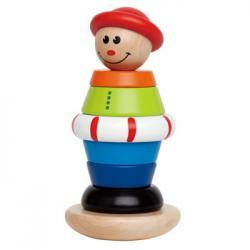 Colourful wooden circles let kids dress this character from tippy toes to top hat. Post on the base has an elasticized hinge for safety. Wobbly base adds to the excitement. Hape toys are made from environmentally friendly materials using rubberwood, bamboo and birch plywood.